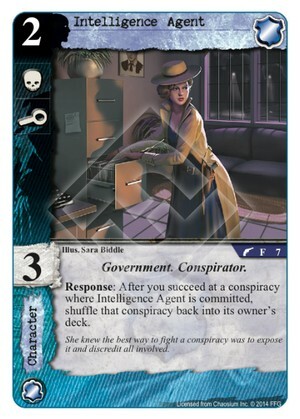 Flavor Text: She knew the best way to fight a conspiracy was to expose it and discredit all involved. Is this why they unrestricted negotium??? I'm more thinking shuffling your own copy of The Guardian to keep tutoring for Day/Night cards. I do like that it's a Response and not Forced Response, so you're not forced to put it back when you don't want to. Danigral - 4 out of 5. With Negotium being so well-known that's the first thing that comes to mind, but I think we’ll see a number of decks that try to abuse the new Agency conspiracies. Intelligence Agent doesn’t flinch at The Great Work. The best thing is that even if there aren’t any conspiracies out, she’s still a decent attacker. mnBroncos - 4 out of 5. So if you are playing with a deck that can’t beat Negotium here is your answer! It is hard to say how much will see play because only so many conspiracies see play, however, this can really hurt some decks that are relying on Negotium or Festival. Obtuse - 4 out of 5. Nice icons and skill for the cost. Oh, and you were worried about Negotium or any of the other good conspiracy cards? Not anymore. livingend - 4 out of 5. 2-0 for the ladies in this box, although our undercover gal is probably a more solid hit than Dr. Maire *wink wink nudge nudge*. With all those powerful new conspiracies flying around Intelligence Agent will certainly find its way into many decks. When it comes to alternatives in the field of conspiracy thwarting, she’s definitely better than Foiled! in decks without Flooded Vault, but even her two icons and skill 3 can’t hold a candle to Frozen Time. Versatility trumps all in that regard. Verdict: A potent meta-call is still a meta-call. Nonetheless, it’s very likely that you should jam three of these in your Agency decks for the next 1 or 2 months. WWDrakey & Ire - 4 out of 5. Being able to play weenie-heavy and pack an automatc anti-Negotium tool is... pretty cool. Also, 3 is a good skill to have on a 2-coster (avoids several Hastur effects, as well as not getting zeroed by a Torch Singer).